I had great pleasure being part of a group privileged to enjoy a conducted tour of Watermen’s Hall by Carol Ratcliffe, Assistant Clerk, a lady who obviously lives and breathes her job and whose enthusiasm was infectious. We began in the Silver Room on the ground floor where the walls were lined with reclaimed wood and engraved with the names of the elected Masters, from the first, Francis Theodore Hay, in 1827, to the present day. Prior to that the Company was governed by the Rulers. 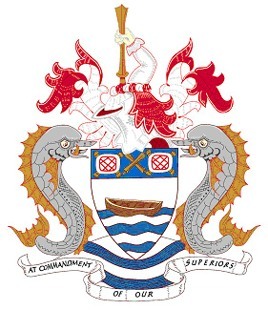 The Watermen’s Company celebrated five hundred years last year, having received Royal Assent from King Henry VIII and created by an Act of Parliament in 1514. With this Act came the introduction of apprenticeships and to this day the company is a working guild, one of only two, I believe. Livery Companies were by contrast created by Royal Charter. The Watermen were joined by the Lightermen, carriers of cargo, in 1700. There was much to see in this first room alone but outstanding for me was a model of a wherry, something of which I’d heard but didn’t know what it was, and the story behind it. Wherries were passenger boats in the style of a rowing boat and carried eight to ten people. They could be hailed from their position midstream by someone on the river bank, much in the same way one would hail a black cab in the street today. If they didn’t like the look of you they stayed where they were! It was no easy job and the skill and bravery of these men was outstanding. Also on ground floor level was The Parlour Room with its beautiful stained glass window and display cases which house some of the Company’s artefacts. 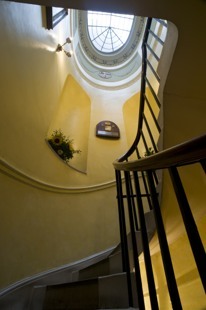 We went up the rather beautiful staircase to The Court Room, the heart of the original Georgian building. It is the only original Georgian Hall left in the City of London. Those of you who are aware of my work in progress, a novel set in Regency times, will appreciate my interest in this particular room. It is thought that there might have been some influence by Josiah Wedgwood as the ceiling is in that style and he and designer, William Blackburn, were contemporaries, though there is no proof that they ever met. The walls and ceiling, at some time painted yellow, have been restored to their original blue, the ceiling picked out in pink and gold leaf. The marble fireplace is believed to be designed by John Sloane and above it hangs the Company coat of arms. Some of the contents of the room are the amazing Master’s Chair, a portrait of the first Master and, in one corner, a fabulous barometer which dates from 1693. To this day the apprentices stand before the Master and other members of the Court to receive their Freedom and become known as Journeymen Freemen. Moving into the adjacent room we were told that this wasn’t part of the original building but that two adjoining buildings had been incorporated at a later date. These had suffered severely from war damage but the exteriors were intact. They have now been sympathetically renovated and decorated and are used as function rooms for commercial hire, as well as by the Company itself. Carol gave us many more details. She told us about “The Doggett’s Coat and Badge Wager”, a sculling race purported to be the oldest continuously run annual sporting event in the world. 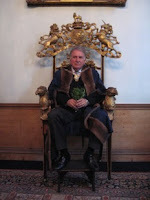 It is held in conjunction with the Worshipful Company of Fishmongers and has been going for 300 years. We heard of the part the Watermen played in the evacuation of Dunkirk and how their skills then, and on many other occasions, were effective in saving lives. We learned that there are fifty-one alms houses in Hastings used for the benefit of the Watermen and Lightermen of the River Thames or their widows or widowers. I learned much about the river which I have lived close to all my life, some of which I hope will find its way into my book. Whether it does or not, this was a day to be treasured; one which highlighted the bravery and enterprise of man and the comradeship of the members of this historical society right through to the present day. Guided tours take place on Mondays only. I highly recommend that you go. 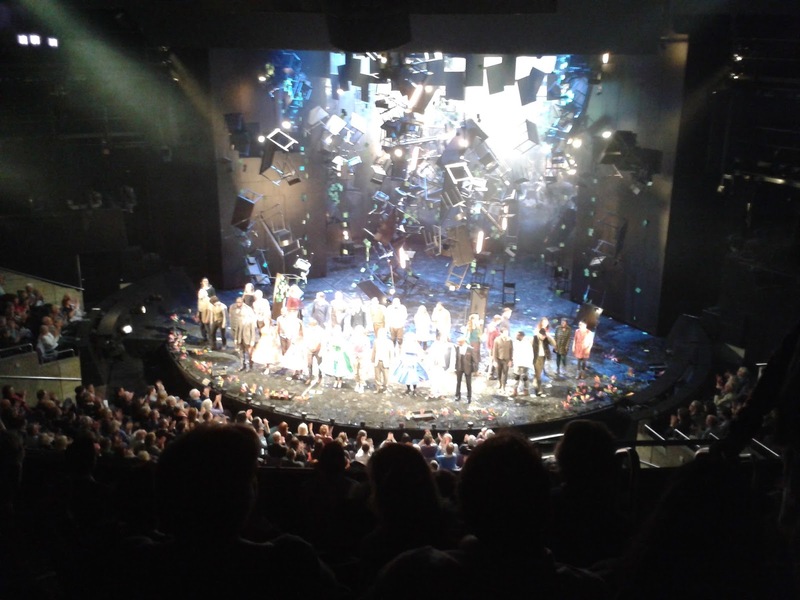 As You Like It and, oh my word, did I like it! I’ve just had the most amazing evening! It began with early dinner at a favourite restaurant, TAS in The Cut, the sort of meal you have at 5.30pm because you’re going to the theatre. It was wonderful but I’m not here to tell you what I had to eat – or drink! 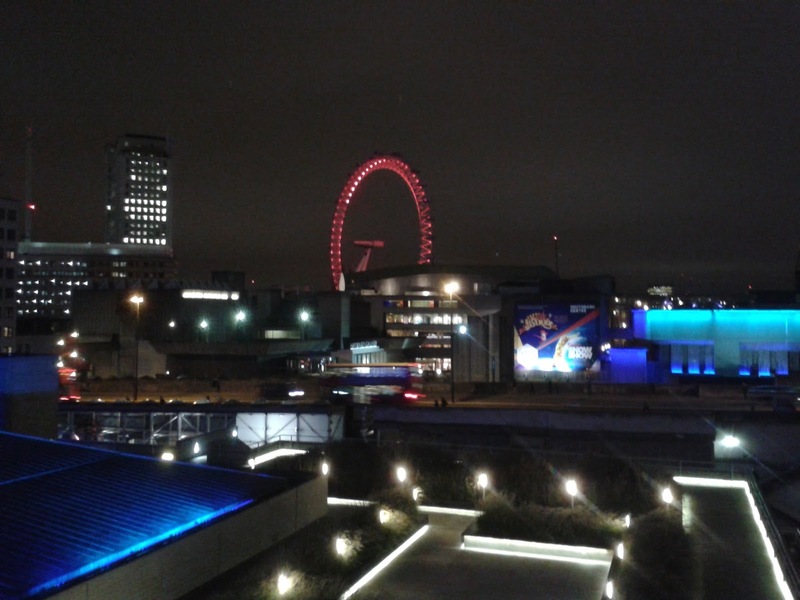 However, rather more full than was comfortable we walked from there to the National Theatre to see Shakespeare's 'As You Like It' at the Olivier. It was a first for me, the play not the theatre. Before we went in I couldn’t resist taking this photo from the balcony. We had circle seats and a wonderful view onto the stage which was startlingly colourful in a way I can’t even begin to describe - but I’ll try. The floor was covered in large bright squares of red, yellow and green, and the semi-circular backdrop was lined with computer screens and desks, at which were sitting several of the cast wearing yellow jackets, almost like those in a holiday camp. Towards the front were chairs and tables like small trestles, laid out café style. 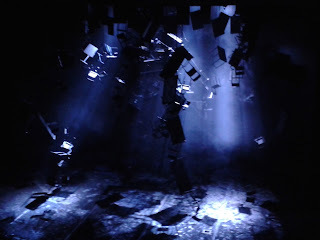 At the end of the first scene the lights dimmed, the brightly coloured floor slid backwards and everything else, computers, desks, tables and chairs, slowly lifted to take the form of a dark forest. A bit of imagination was required here but it wasn’t an impossible shift to see these tall angled objects as trees. Anyway, see what you think. I was able to take this photo because there was a slight hitch and they had to interrupt the performance for about ten minutes. The comedy was delicious, the skill of the writer unsurpassed, the story as fresh today as it must have been some four hundred and fifty years ago. What was also first class was the standard of the actors (there was only one I was a little disappointed with) and the superb production. Rosalie Craig's Rosalind and Joe Bannister's Orlando were excellent but for me the star of the show was Patsy Ferran playing Celia. What an amazing talent! I know one isn’t supposed to take photos in the theatre and I wouldn’t dream of doing so during a performance but I just couldn’t resist taking this one at the end. 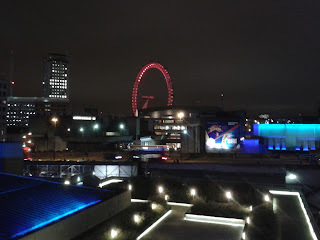 I couldn’t quite shake off my writerly head though it in no way detracted from my enjoyment of the evening. If anything it enhanced it as I watched the skill with which the master carried out his twists and turns, a thread here, a diversion there, and the whole coming together with such apparent ease. I probably won’t sleep tonight. I don’t mind. The show runs until 5th March 2016. You won't be surprised to know that I thoroughly recommend it if you have the opportunity to go.